“Your emotions are made in God’s image,” states author and Spectrum contributor Marc Alan Schelske at the beginning of his new book. For some Christians, this can be a difficult truth to wrestle with. It was for Schelske. My church measured faith in intellectual terms. Our precious spiritual practices were memorizing Scripture, debating theology, and defending our faith through apologetics…Even our music was intellectual. Either it was the old hymns, with six verses of dense theology, or classical music, which was superior because, like math or literature (I was told), it edified the mind…Our public prayers were carefully thought through, articulate, and theologically accurate rather than spontaneous, heartrending, and embarrassing…transitory emotions were just not trustworthy. We needed something solid. In the church of my childhood, that meant relying instead on established doctrinal interpretations. It meant staying faithful to our community’s moral standards. It meant doing what was right because it was right. In fact, that was the highest definition of a godly person: someone who would go against culture, who would face down opposition, who would even go against his or her own feelings to do what was right” (53-54). This aversion to emotion led Schelske to suppress his feelings for years, which effected his own emotional health, his marriage, and his role as senior pastor of a newly formed congregation. 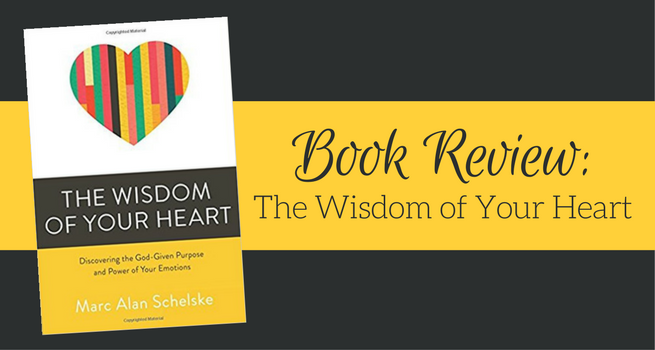 In Wisdom of Your Heart, Schelske offers the reader an opportunity to view emotions in a new light. The book is divided into four parts. The first section is a deeply personal look at Schelske’s own life, from childhood to adulthood, and how his ability to understand and appreciate his own emotions was hindered by personal tragedy, religious upbringing, and deep-seated feelings of self-doubt. In part two, Schelske examines the many instances of emotion in the Bible, with a focus on those expressed by both Jesus during His time on Earth and God the Father in the Old Testament. Part three explores the latest neuroscientific findings about emotion, and how those feelings effect both mind and body. In the fourth section, Schelske wraps up his book by discussing concrete steps to identify and process one’s emotions, leading to a better understanding of both self and God. How easily I become so committed to my own picture of God. When I do, I lose the ability to be confounded and surprised by God. We all have pictures of God in mind. Anytime we think about religion or spirituality, our pictures of God become active filters shaping what we think. We may not consider ourselves theologians. Many people even find the words theology and theologian off-putting. Yet we’re all theologians, for we each curate a collection of images of God in our minds. Fortunately, followers of Jesus have a natural starting point for this discussion. We’re not thinking about God in the abstract. We’re looking at a person…We don’t have to wonder what God is like. Like a gardener trimming back overgrown brambles, Jesus came to clear out long-held assumptions about God (84-85). He continues, stating, “of course, there’s a problem with encouraging people to look at Jesus. Which Jesus are we referring to? All Christians (and many non-Christians) have what they consider to be a well-formed mental picture of Jesus. That picture, however, may draw little from the text that teaches us about him” (85). Schelske then goes on to explain the many emotions expressed by Jesus — including compassion, love, rejoicing, amazement, grief, and anger — and what the original Greek words and their translations can teach us. “For Christians, the starting point for thinking about both God and emotions is Jesus. If Jesus is our model, then we can safely say that anything we see in the life of Jesus can have a healthy, even godly place in our own lives” (94). In the same way I reviewed the Gospels, looking for indications of emotions in Jesus’ life, I turned to the rest of Scripture, searching for descriptions of emotions in God’s experience. I didn’t have to look far. The chronicle of God’s emotions starts at the beginning of the story and runs through the last pages. The depth and variety of emotion in God’s experience surprised me” (99). The more he studied the emotions of God the Father and Jesus in Scripture, the more he realized, “we have emotions because we were created in the image of God” (121). This idea is supported time and time again, and through Schelske’s careful and gentle leading, the reader can see this truth clearly. But that doesn’t mean a life lived in fear and guilt of our own emotions can so easily be lifted from our shoulders. That’s where the fourth section of the book, “How to Hear God in Your Emotions,” comes in handy. Schelske asks the reader to start following a sequence of five steps for interpreting emotions: attend, articulate, ask, assay, and apply (249). Emotions exist to move us. The energy building within us during an emotional response dissipates only when we take action. That’s why we react. The goal of emotional maturity, however, is to channel this emotional energy into constructive and life-giving actions. Emotional discipleship is the process of learning how to channel this energy into a life that reflects and honors Christ” (263). I’ve so appreciated reading Marc Alan Schelske’s nuggets of wisdom over the years that he’s shared on his blog, and in his Spectrum articles, and so I began reading The Wisdom of Your Heart with confidence that I would find a better understanding of God within its pages. And I did. But, more than that, I resonated deeply with his story, his upbringing, and his struggle with emotions. As I read, I felt I was on the journey with Schelske, and we were discovering together a new-found understanding of God, of self, and of relationships. That, I think, is one of the marks of a great writer: when they can make you feel as if you are on the journey with them, even though in reality, they have found the path first through hard work and sometimes pain, and cleared the way for you to follow, to learn, and to discover. Alisa Williams is managing editor of SpectrumMagazine.org.